CFP is ongoing – Apply now to be a speaker at the conference! 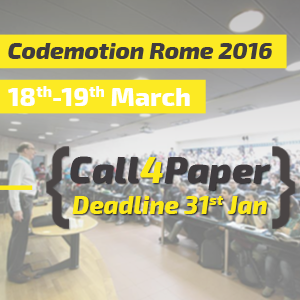 Codemotion Rome 2016 Call for paper is ongoing! Don’t miss the opportunity to take part to one of the coolest tech conference in Europe! Apply now! Call For Paper Deadline is the 31st of January. Don’t waste time and submit your proposal now!